To some, the Lotus Evora Sport 410 is a pretty remarkable car in terms of performance, representing the best evolution of the sports car after the Evora 400. 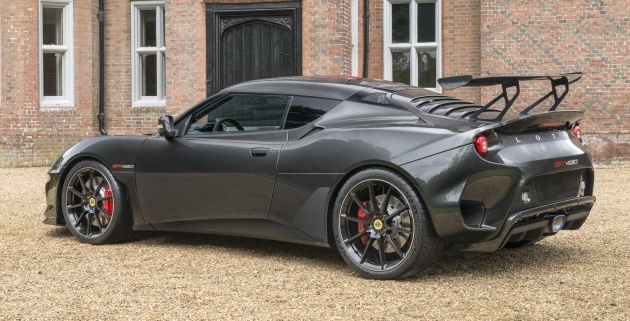 However, Lotus feels the car could do with more (and less) in several aspects to improve it even further, which is why the team at Hethel created this, the new Evora GT430. Let’s start with what the Evora has been given more of, starting with the horsepower count. The 3.5 litre supercharged and charge-cooled V6 now makes 430 hp at 7,000 rpm and 440 Nm of torque from 4,500 rpm, the latter thanks to the addition of an air-to-liquid cooler for the low inertia, six-speed manual gearbox (with a Torsen-type limited slip differential). Compared to the Evora Sport 410, the new Evora GT430 will accomplish the zero to 96 km/h (0-60 mph) sprint in just 3.7 seconds instead of 3.9 seconds. The top speed for the limited edition model is set at 305 km/h, identical to the Evora Sport 410. Other revisions are a new titanium exhaust to “further amplify the car’s aural presence,” along with an enhanced aerodynamic package. That second bit includes larger front intakes, a new carbon fibre splitter, air blades and louvers on top of each wheel arch, rear aero ducts, large rear diffuser and a prominent carbon wing. According to Lotus, the car generates up to 250 kg of downforce when it is travelling at its top speed. Mechanical grip is improved with wider (+10 mm) Michelin Pilot Sport Cup 2 tyres, measuring 245/35 at the front, and 295/30 at the rear. They are wrapped around a set of ultra-lightweight forged aluminium wheels that are available in different colour finishes. While there’s plenty that has been added on, Lotus hasn’t forgotten about its mortal enemy, weight. Despite the new carbon rear wing (+4 kg) and larger wheels and tyres (+5 kg), the car’s overall dry weight is still down by 26 kg, to 1,258 kg. Compared to the “heavy” Evora Sport 410 that tips the scales at 1,270 kg, the new car is now the lightest road-going Evora. A breakdown of where the weight has been shed is as follows: standard titanium exhaust (-10 kg), carbon body panels (-4.7 kg), lightweight interior components (-2.5 kg), Öhlins and Eibach adjustable spring and damper assembly (-10 kg), lightweight rear brake discs (-2 kg), a thinner aluminium undertray (1.5 kg), the introduction of lightweight aluminium brackets (-1.3kg), lightweight polycarbonate backlight glass (-0.5 kg) and a re-profiled fluid fill system (-2.5 kg). 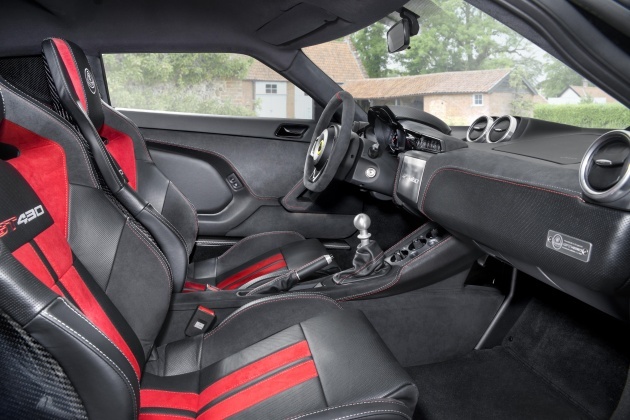 Inside, the Evora GT430 gains some new Sparco black leather/Alcantara racing seats, which can be specified with four-point harnesses and titanium rear frame if you need the immersion to be even deeper. The black leather/Alcantara combo can also be found on the steering wheel, dash, door panels, transmission tunnel, and centre console, with contrast stitching available. If you want to ruin Lotus’ efforts, you can also specify an optional integrated touchscreen infotainment system with iPhone connectivity, Bluetooth, satellite navigation, and a reverse camera. Only 60 examples of the Evora GT430 will ever be hand built in Norfolk, England, for sale in select markets around the world. Lotus didn’t reveal how much it will cost, but did confirm it is now accepting orders. Limited? You are not Ferrari or Bugatti. Worst, you are related to Proton and China brand. The 60 units also got excess. At least it has limited edition plates & kits. U think this is like ur Gaztipu Vios keli Sport Edition thats alredi Rm10k overpriced on an alredi underspec overpriced junk? Toyota is like junk foods. Just becuz both have high sales dun mean its gud! funny la you.. true drivers (or people who can afford it) did not see Ferrari or Bugatti is the only super car in the world. Clearly you are not one of them. 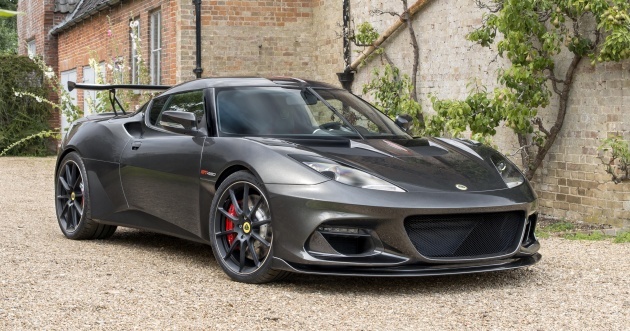 You really don’t know about Lotus…and what is Lotus Evora!!!! How to pay RM500k for a car with a mere Toyota engine and half of the parts are Made by Proton? Even side mirror got words Made by Proton and got Proton logo on it. U may not know how, but lotsa other pipu do. Someone who is looking for zero to 96 km/h (0-60 mph) sprint in just 3.7 seconds with a puny price of Ferrari. No? Lotus know some great stuffs. Toyota 3.5 litre V6, Gold medal engine. So damn good looking front and rear , and the air down force architecture is totally insane! I love it …. I was wondering when and how this month’s lotus new addition would be. Still waiting for that all carbon fibre lotus.